Dr. Chris Oswald is a Chiropractor who owns and operates one of Canada’s leading chiropractic and multidisciplinary clinics in Toronto, Canada. Nationally ranked athletes, leading Canadian performers and musicians, and members of Toronto’s business elite are among his patients. 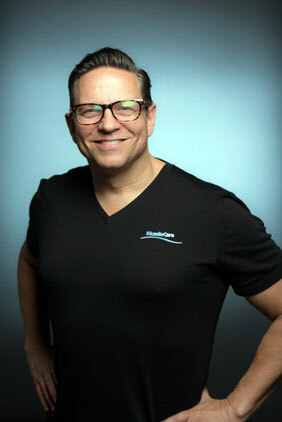 He received his Bachelor of Science, specializing in Human Biology & Human Kinetics, from the University of Guelph in 1984 and graduated as Doctor of Chiropractic, from the Canadian Memorial Chiropractic College in 1988. Respected as one of North America’s leading authorities, Dr. Oswald is a regular contributor and lecturer for the Canadian Memorial Chiropractic College, Northwestern Health Sciences University and the Canadian Chiropractic Association. Dr. Oswald’s decision to create his own line of premium scientifically based ergonomic, health and wellness products was based on his dissatisfaction and frustration with existing products that fell short of their claims. His client base of 20,000 patients serve as an ongoing focus group for product ideas and testing based on real consumer needs. This lead to the development of MuscleCare! MuscleCare is an all natural topically applied pain product. MuscleCare offers people a safe and sceintifically effective therapy for pain, spasm, and inflammation. No drugs, nothing injested, simply roll on or rub in and let the magnesium and other natural products help tight tissues release. Check out the video to learn more about Dr. Chirs and MuscleCare and feel free to visit www.muscelcare.net to learn more about these innovative healthcare products! MuscleCare is available online in in our Yonge and St. Clair clinic at 1 St. Clair Ave East, suite 1001. Try it out today!